I’d like to say how grateful I am to have been Freshly Pressed again, allowing this blog to experience its own wintry blizzard last week of 3,500 views from 80 different countries. I’d like to send out a sincere thank you to everyone who stopped by to take a look, press a Like button, or leave a comment. Thanks also to those who shared The City of White through re-blogging, tweeting, or perhaps even the old school method of word of mouth. And finally, to the 2oo or so newcomers who just subscribed — hello, and welcome! I was already camera in hand as I approached the street bordering the western edge of the Jardin du Luxembourg (seen above) and my imagination warmed with anticipation of a winter’s promenade: I would stroll through its broad tree-lined alleys, past the frozen fountains and pétanque courts, and finally to the heart of the park with its picturesque sailboat basin and Italian-inspired royal palace. What I found instead was 12 vertical feet of wrought-iron discouragement, as apparently the snowfall was enough to warrant the closing of the public access gates. But for those willing to risk the cold bite of an exposed shutter button finger and the sidewalk stampede of perturbed joggers displaced by the park’s closure, there were still a number of charming views to be captured through the fence’s bars. And in hindsight the purity of inaccessible snow was a rarity in its own right, so no harm done. 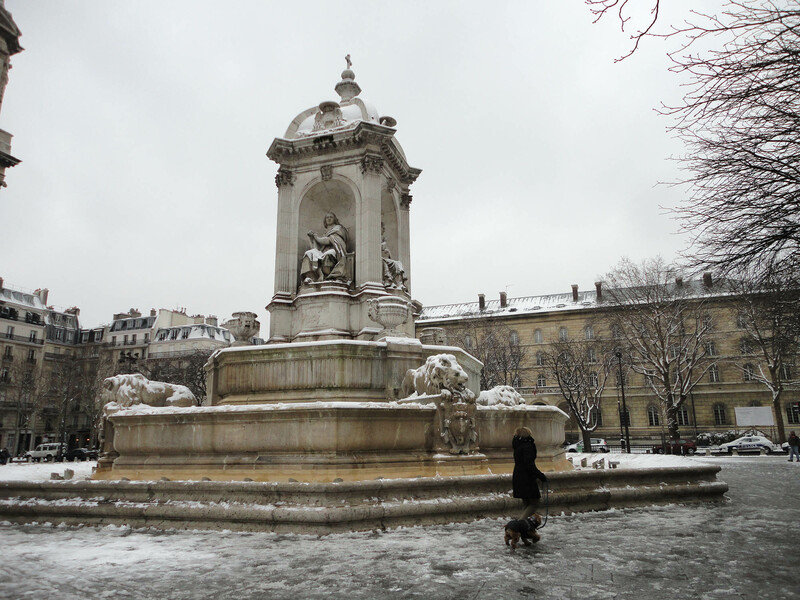 …until I reached the Place Saint-Sulpice, one of my favorite spots for sitting and steeping in the juices of a Holy-Crap-I’m-In-Paris moment. 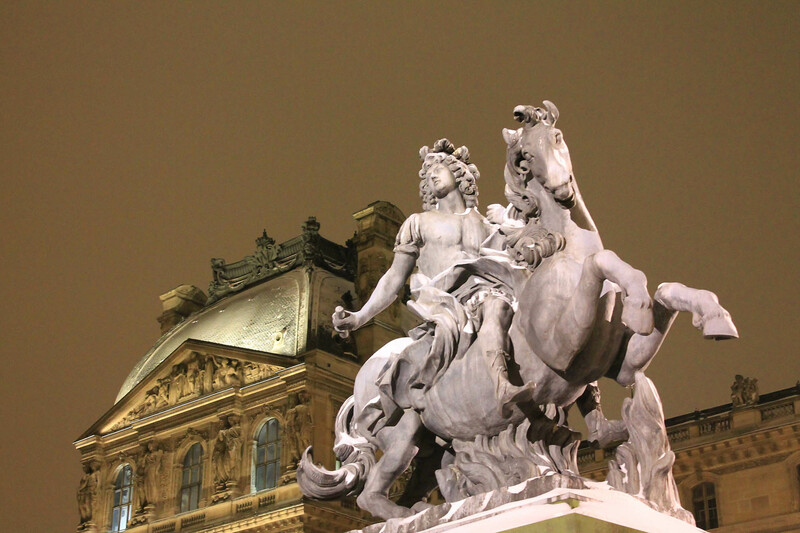 The fountain, by the architect who designed Napoleon’s princely tomb at Les Invalides, gives the public square an air of confident grandeur and urban order that to this foreigner feels quintessentially European. 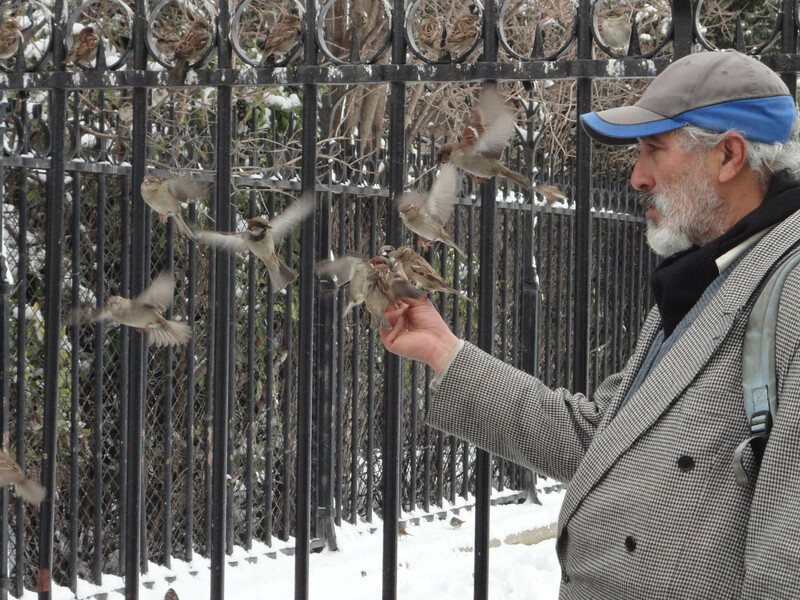 Thoughts of fur turned to feathers in front of Notre Dame, as a man attracted a small crowd with his uncanny knack for reminding Parisian sparrows how much they love birdseed. 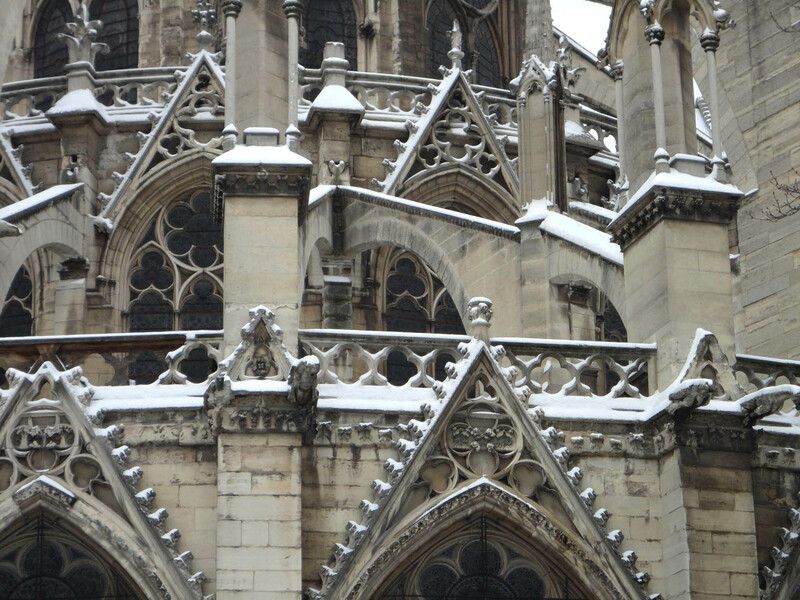 Behind the church the usually tourist-heavy Square Jean XXIII had an uncharacteristic calm that almost seemed to harken back to the area’s medieval past as a monastic residence, and as the snow slightly muffled the city’s noises it wasn’t hard to hypnotize yourself with the existential contemplations of 21st-century snow on 12th-century stone. 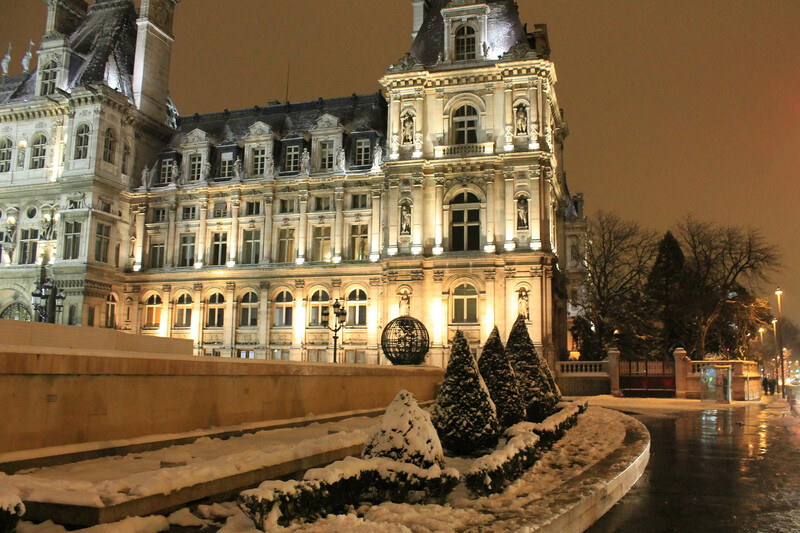 A few hours later the street lamps sparked to life to offer a final take on things, and Paris, ever chic and fashionable, seemed eager to show how effortlessly she could transform the snow into evening wear. 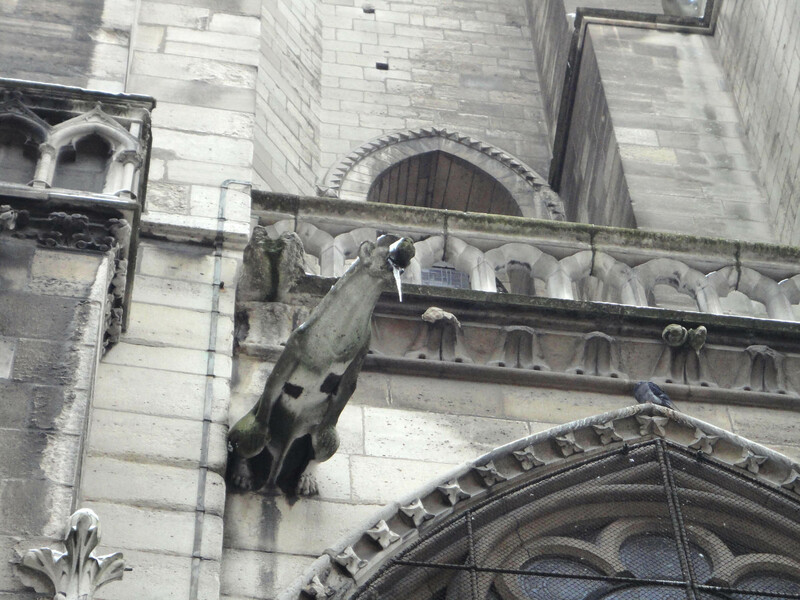 Before heading home I made my way to the Hotel de Ville, back to Notre Dame, and down a few streets of the Latin Quarter for good measure. Unfortunately these views weren’t built to last; Paris has since warmed and melted, donning her more quotidian trappings of cobblestone and concrete, gravel and grass. But I’m happy to have experienced my favorite city in so rare a fashion while it lasted, and to have had a chance to share it with my readers, old and new alike. I’m going to keep coming back to this series because the pictures just make me happy. Thanks for the great photography and for the future pleasure they’ll bring. Oh, what a pleasure to hear that, you’re very welcome! 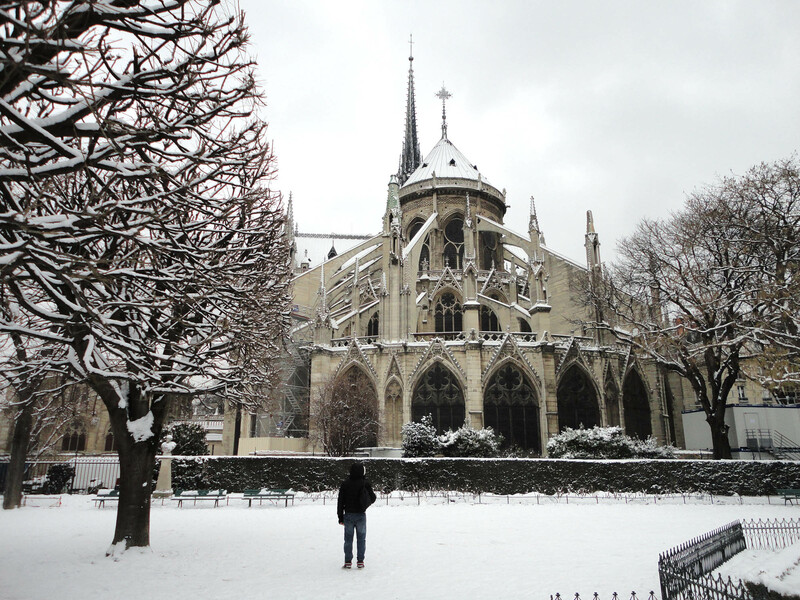 Thank you – I love these photos particularly the church roof in the snow, the horse statue but even better the restaurant in the snow – thanks ! You’re welcome J Wilson, I never know exactly which pictures will stand out to people, so I appreciate the feedback. Thanks for commenting! I too love these pictures! Some of the most atmospheric I have seen in a long time. 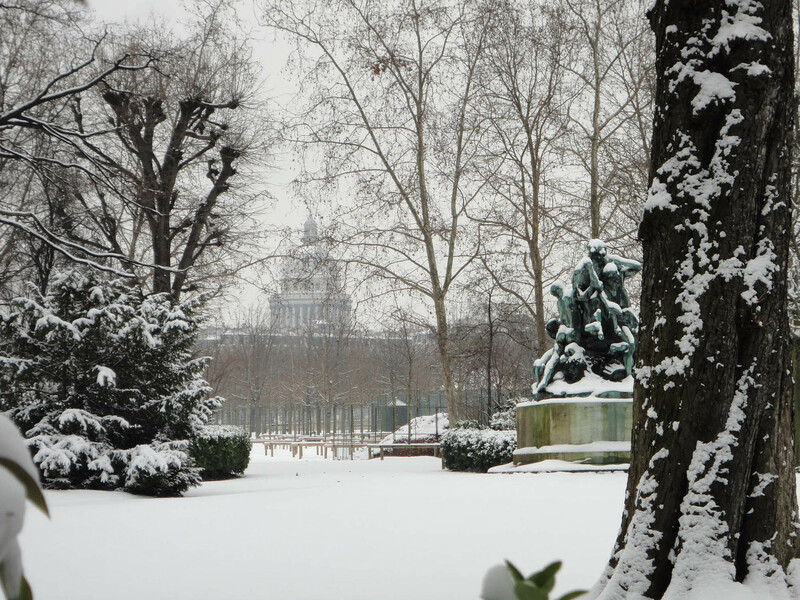 Personally I loved the pictures of the Jardin du Luxembourg – I can almost feel the chill coming off the photos! Lovely. I’m going to get there someday…..sigh…. I especially love the evening shots. Great photography! Great, many thanks for reblogging! These are beautiful photos. 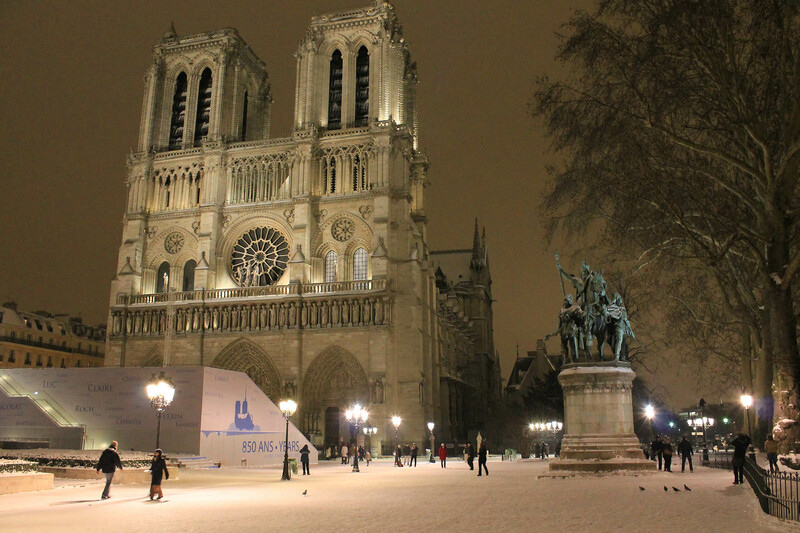 It almost makes me wish I were visiting Paris in the winter, rather than this coming summer. Oh well – guess I’ll just have to plan another trip for a future winter! Absolutely! I hope you and your mom have a great time here. I enjoyed your site, very informative and rich with content! Those evening pics are gorgeous! Yes, we have also melted here across the English Channel, and currently *enjoy* mud. Everywhere. I hope you’ve been spared! Thanks Dena! Hope you and the family are doing well. Bravo ! Bravo ! Gorgeous, gorgeous shots !! Magical. T.
Thanks Theadora! I’m really an admirer of your blog, so a compliment from your neck of the woods is always a treat. :) So happy you stopped by! Ah, the feeling is mutual ! And congratulations on the “Fresh Pressing.” It’s well-deserved !! 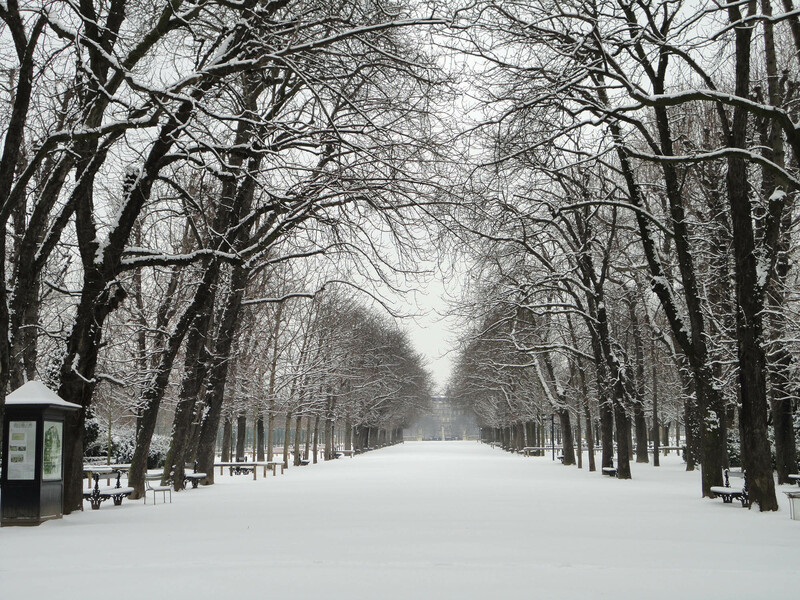 T.
Lovely post, snow really does make already picturesque places even more so. 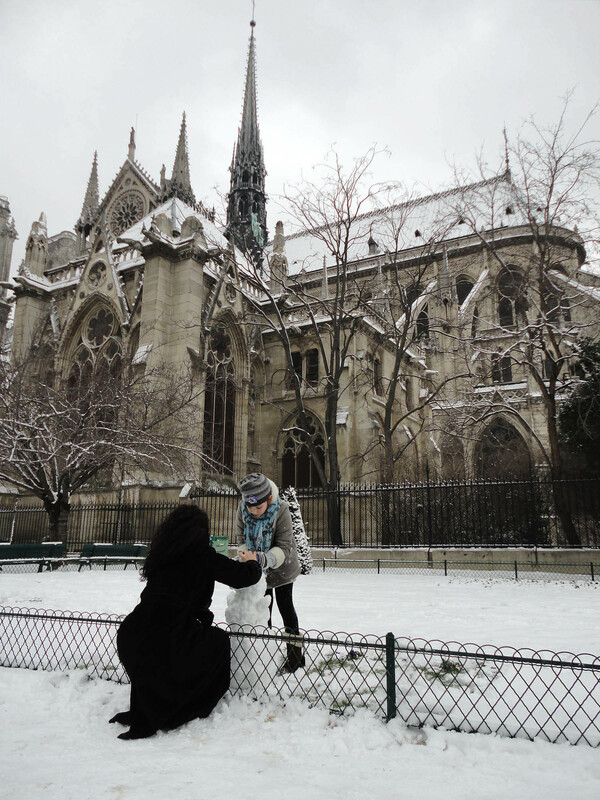 Getting sick of the snow here, the novelty wears off quicker than i’d imagine it would in Paris. 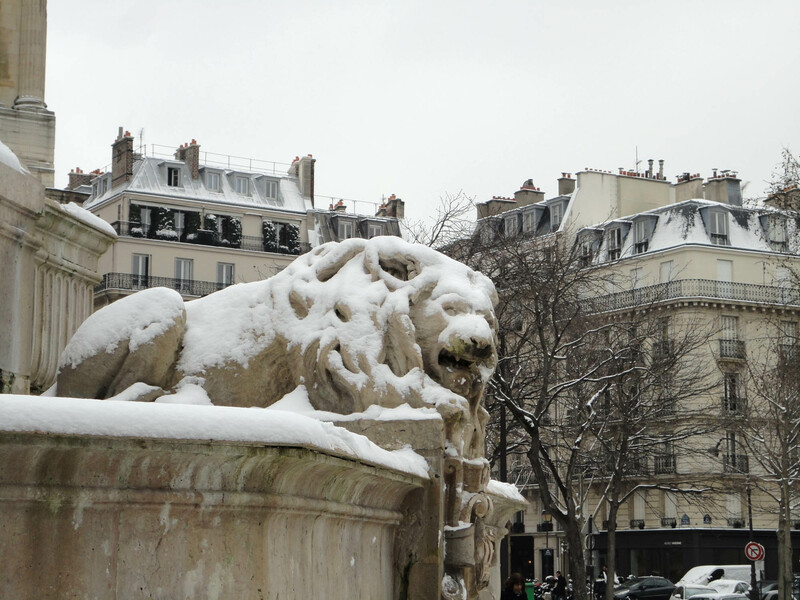 If any city deserves to be continually blanketed in snow, it’s Paris. Amen to that. If you’ve done any blog posts showing the snow there, please link it up for me, I’d love to see it. Btw I finally located where you are on the map — not too far at all from Prague. Nice! Tis an hour away on the train so a decent commute really. Once I’m settled here and get a job I’ll head in and explore. 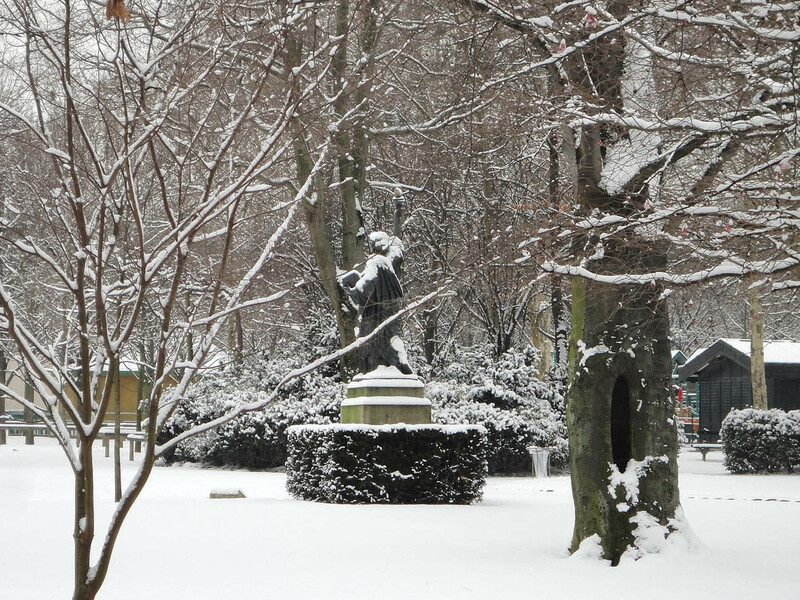 The snow is mostly cleared up here, the squares, roads and paths are all snow free. The video I linked to in the entry Our New Home was probably the most snowfull media I have so far. Nice, I liked the video, thanks for sharing. I’d really be interested in visiting that part of the world one day and seeing what that culture is like. Good luck with the job search! Is it possible to get by with English there or are you learning a new language? I’m hoping to teach English so I don’t need to learn Czech for that but of course I’d like to be able to interact with the locals and respect their language and culture. Yeah a bit of respect for the language goes a long way, which is advice I often give to Paris visitors. I realized I have no idea what Czech sounds like, but best of luck with it. Oh and thanks for liking my “Best Poster Ever” post, you’re the first one, haha. But it made me laugh when I saw it in the subway so I had to share it with the world, too funny. I was in Paris in October, and am planning on returning soon. Love this city so much and I truly wish I could permanently relocate there. You are so lucky to have this magical city to experience every day! Thank you for keeping the memory alive for me. You’re very welcome! So glad you enjoyed it. Yes I’m lucky indeed, and I try my hardest to not take it for granted (hence this blog). :) I hope you do make it back soon and I hope you have a great time! Wow. I’m speechless. Can only say thank you for these wonderful images and that I had the chance and honour of beholding them. So beautiful! You’re quite welcome, glad you liked them. So pretty. Once again I really enjoyed reading this post. Seriously, I think you should write a book. Also I don’t know if you’ve ever seen that movie Ratatouille; it’s a really nice family movie. But the music in it is really good, especially at the end. If you haven’t heard it before please take a listen. The first one is called End Creditouilles http://youtu.be/7q_w7EsZmIE and the last one is called Le Festin by Camille http://youtu.be/p_hdmt4vpBo Just be sure to turn your speakers up a bit. Especially with the second one because it starts off kind of low. I’m still trying to find more french music to listen to but as of right now this is all I’ve got (with the exception of La Vie en Rose, which is another good one). But anyhow, thanks again for this blog post and great pictures. I loved these posts so much. They have made me want to get up and move to Paris. Everything is absolutely gorgeous. I will definitely return to this amazing city one day. Thanks so much Christine. I hope you do make it back to Paris one day, and I hope it’s great! 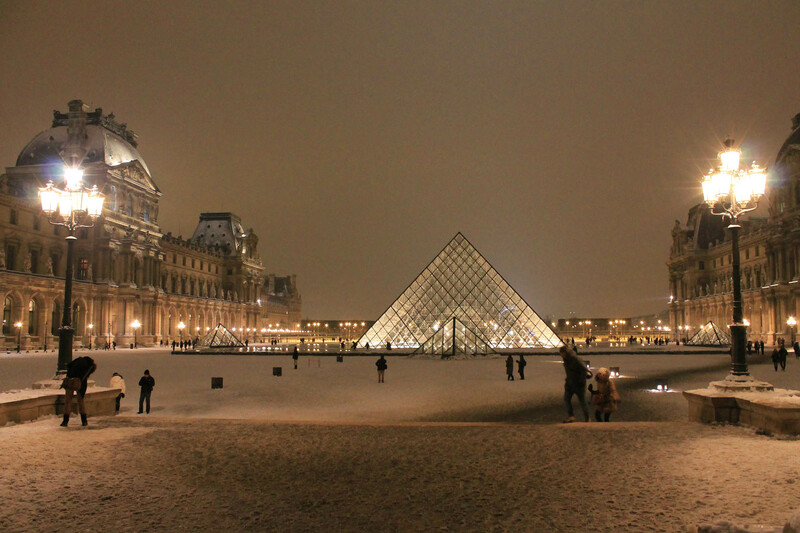 Out of curiosity, what would your first visit or activity be if you were plopped down into Paris right now? Corey, you started my Monday morning in a most enjoyable way. Thank you. How are things with your magazine project? Wishing you lots of success! Thanks for stopping by and commenting. Thanks J.C.V.! Happy to welcome you. Best of luck with your writing! SO happy you were Freshly Pressed for your previous post as it was rally magical … and your writing is every bit as fluid and delightful as your photos! Congratulations – but don’t forget all those of us who loved you BEFORE you were famous!! ha! Speaking of Martha, I re-watched that video of you explaining WhatGives365 and I must commend you on such a fantastically unselfish act. Very generous. VERY classy. I cannot get enough of the beautiful city. I visited in October and I left with beautiful memories and photos of the common and not so common sights. 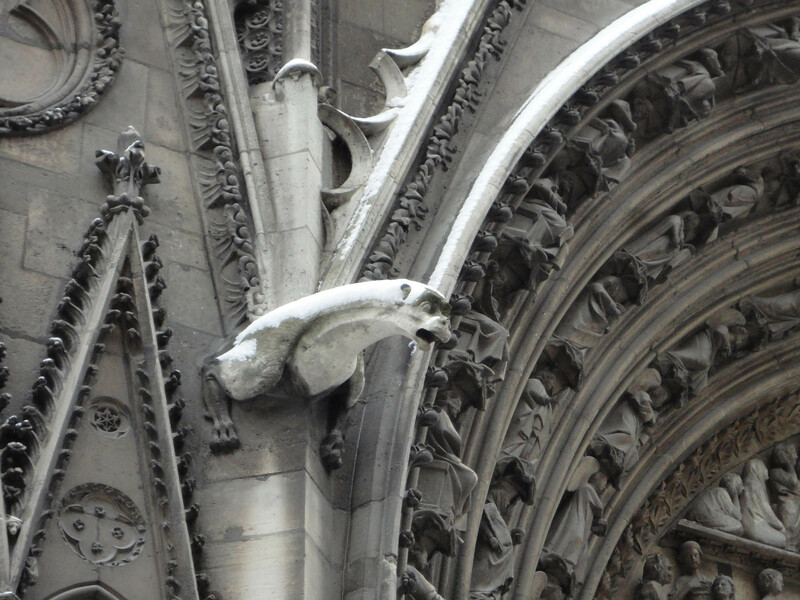 I love that you were able to capture a bit of the foreground of Notre Dame. When I was there materials sat in piles and we wondered what was going to be constructed. Still unsure but I can see something is being built! Thank you for your blog! 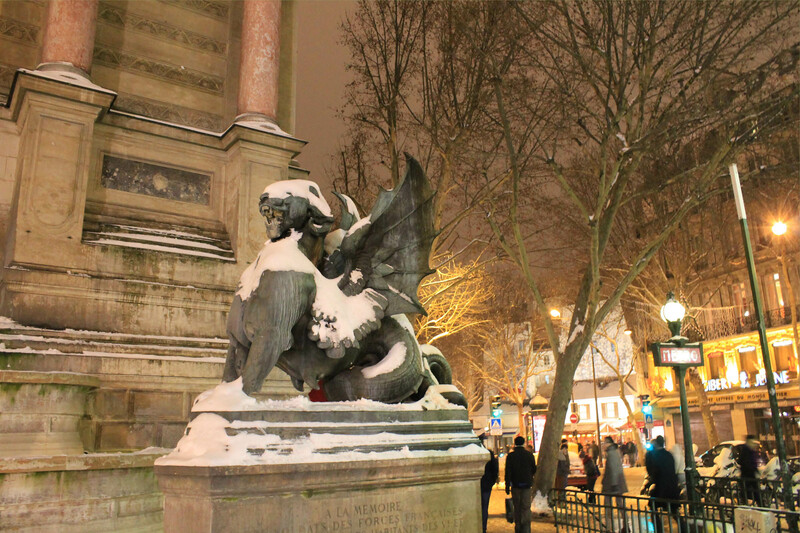 Paris is truly a magical place on its own but snow covered it is breathtaking! I’m glad you enjoyed the post Colleen! The pile of materials you saw, and the structure you see in my picture, is equipment to celebrate the 850th anniversary of the cathedral. 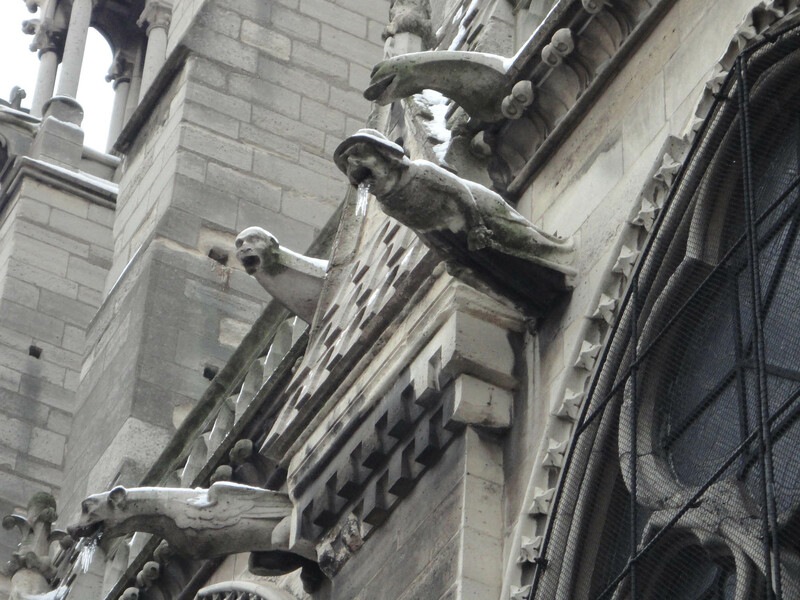 Various events are planned throughout this year, including the installation of brand new bells in the towers which I hope to go see. Thanks for your wonderful comments and take care. I absolutely loved your photos! I’ve been living here for a couple of years now and have never seen so muchsnow accumulate in the city! It was nice while it lasted! 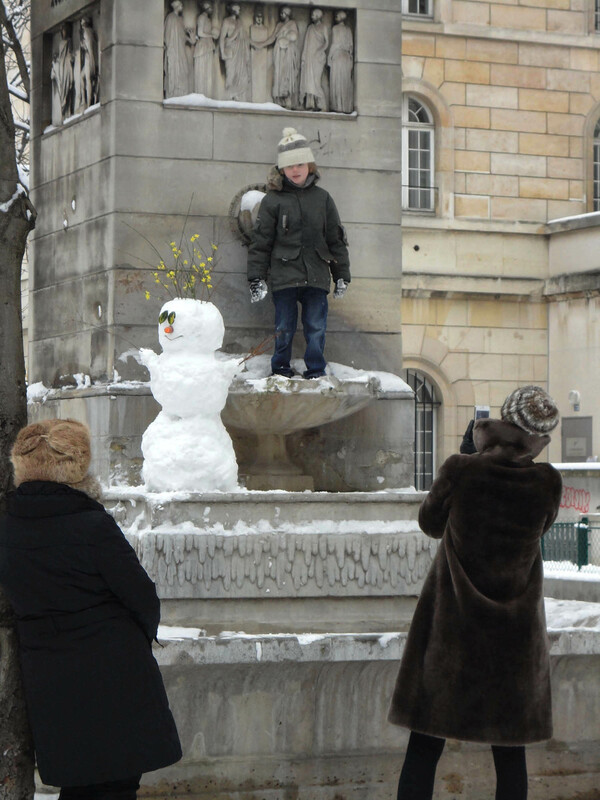 Hi nita, my first winter in Paris was 2010, and there was some decent snowfall, but at the time I took it for granted because I assumed it was normal. Now, after last year’s snowless winter, I made more of an effort to get out and experience the city this time. 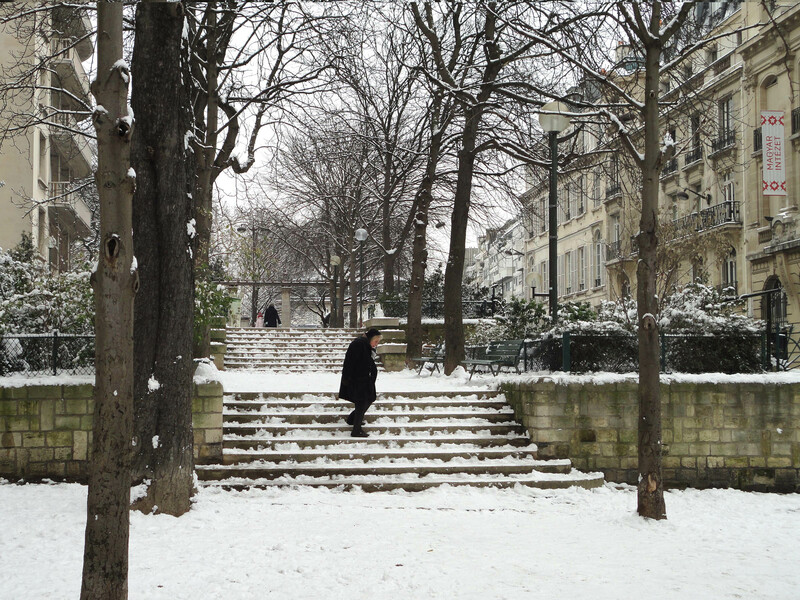 I’m glad I did, because it turns out I’m not alone as a lover of snowy Paris! 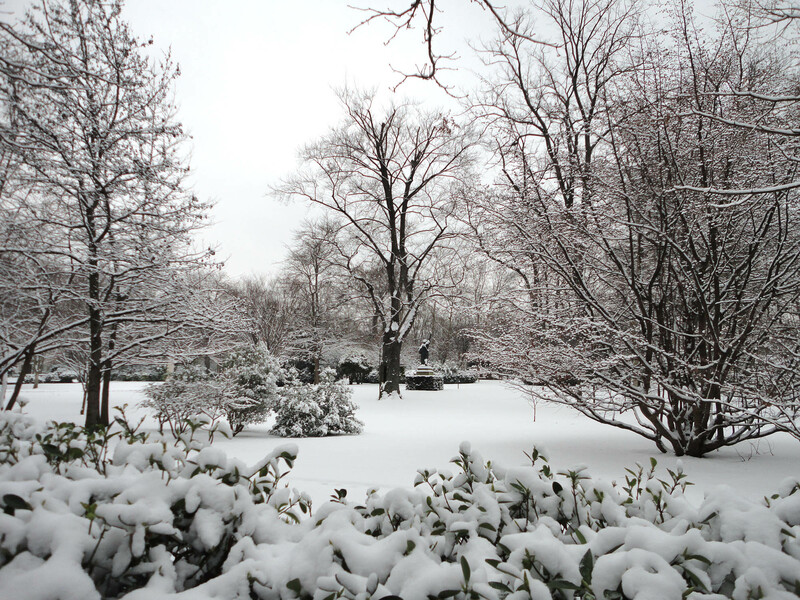 I moved here the winter of 2010 and there was snow, but not as much as we saw recently. Coming from Austin, I hated the winter weather at first. I was so miserable, but this year, I loved every minute of the snow!! Thanks for stopping by my blog! I will definitely be following yours now-I love hearing about other Americans living here! 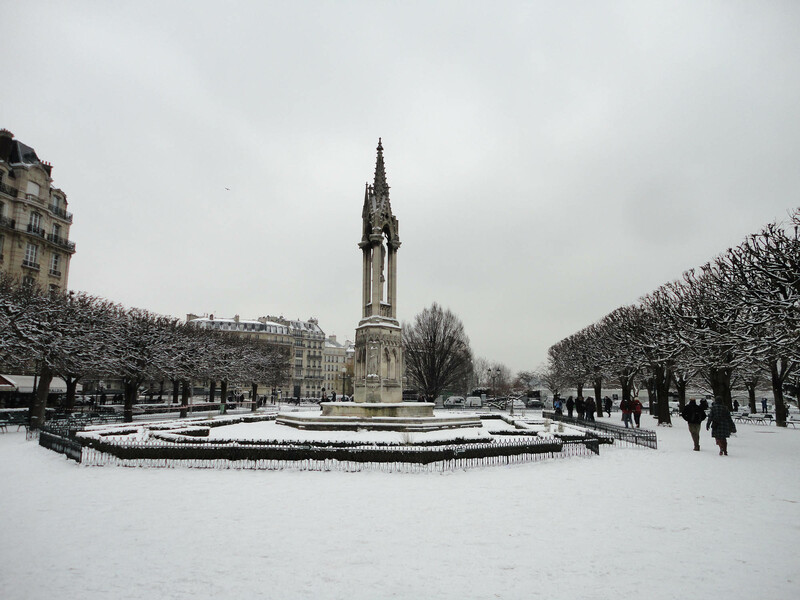 Oh, love Place Saint Sulpice! Have been fortunate enough to stay in Hotel Relais St Sulpice which is tucked away back behind the church. 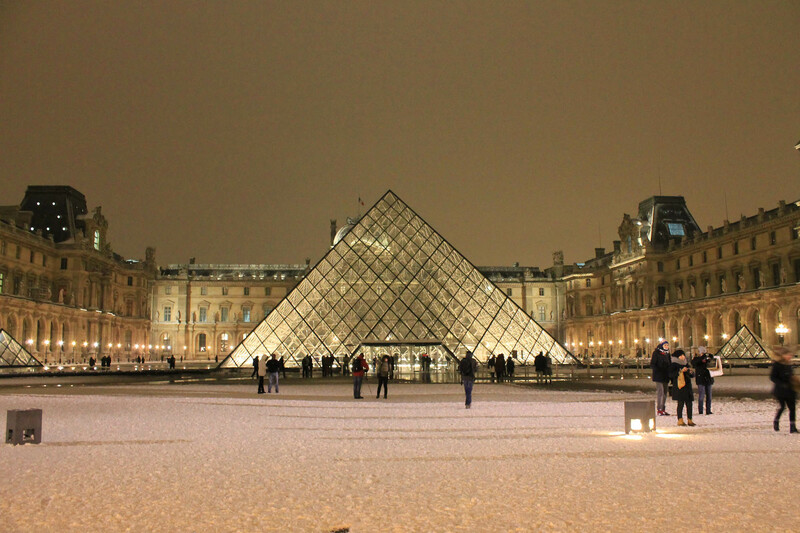 Have shared these last two blogs with my husband and we’ve both enjoyed seeing one of our favourite cities in the snow. That’s great, a fellow St Sulpice lover! I’m glad it brought back some good memories for the two of you. The inside of that church is absolutely stunning, and I hope to post about it one of these days. So happy you commented, thanks and take care! 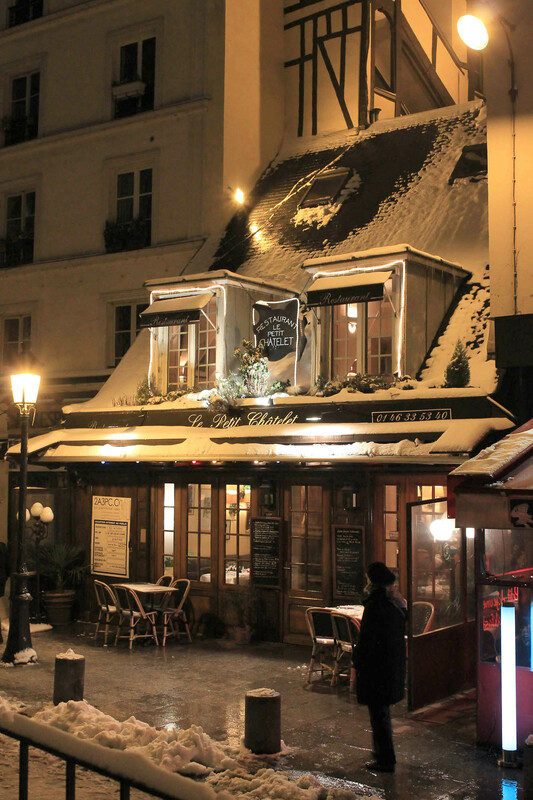 Looking at “Le Petit Chalet” on a snowy evening, I want to walk right in & have a drink & dinner. Really enjoyed your fine photos. Glad you enjoyed that photo, as I was on the fence about including it. I’ve walked by this place many times but I’ve yet to go inside. It certainly does look warm and inviting in the photo, doesn’t it? I just popped over to your blog and you instantly had me at “Downton Abbey and French Tea”!! Big fan of both. You’re quite welcome! Glad you enjoyed it. Thank you Rustic, glad you liked the pictures. I hope you’re able to make it back here one day! You’re very welcome, and thank you for the nice words. :) As another commenter mentioned, it’s pretty hard to find a unique picture of Paris these days, so I was fortunate to find the city in such a rare state! a photographer’s paradise indeed – what a magical sequence of shots documenting a magical transformation of a city.. Thanks a lot for your comment Catherine. It’s true the city had that feeling of “awesome with an extra coat of awesome” that day. I was lucky to be around when it happened. I just checked out your blog — what an incredible story! That really happened to you? What an unbelievable journey you must have gone on toward recovery. Bravo, bravo. Thank you! Yes, this story really happened to me. Generally I focus on other things in my blog—it’s not all about me, haha—but since it was the “10-year anniversary” of my accident, I decided to share my story. I’m very excited to follow your blog. Thank you for all your good work! Your words and images are equal in beauty. Another wonderful post. Take care and happy travels to you. I am so glad you wrote actual details as to where you were located when you took the photos. A lot of site don’t have such info and I find it so frustrating. I knew about the mini statue of liberty and will try to make that part of my plans when I visit. I think I may try to stay in Paris a couple days myself before my great cousin comes. I like to wander aimlessly and he is older and I would like some time to be selfish and just get lost in Paris. I am determined to get the the Tour Eiffel early (so the lines won’t be so long) and climb to the top (using the stairs of course). Then I read somewhere you can have a glass of champagne on one of the levels which I will do regardless of the time. I will be on vacation so who cares? :) Then I plan to wander aimlessly along the Seine and picnic with something I bought in a little shop. When I read something about you heading back towards L’Hotel De Ville it made me think that I would like to see if I can locate what vantage point one of my favorite photos was taken from: http://iconicphotos.wordpress.com/2009/05/08/le-baiser-de-lhotel-de-ville/. Not a unique thing to do I know. Thanks for the great comment Sophia! Sounds like a fun trip you have planned. To recreate Doisneau’s photo, I suggest standing on the northern sidewalk of rue de Rivoli, around the corner where rue de Renard intersects it. The view of l’Hótel de Ville from that area might do the trick, although you may be missing the café tables and the amorous couple. :) Good luck! Thank you Terri, glad you liked it. Yes I was fortunate to catch a glimpse of the city in a rare state that day. Happy travels to you and your wife! :) What’s next on the itinerary? Thanks so much Vicki, I appreciate that. 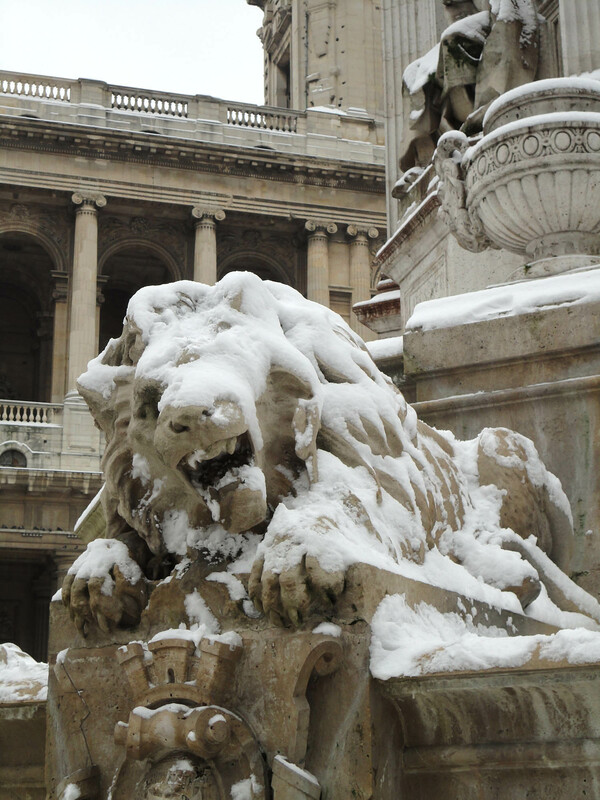 London in the snow doesn’t sound bad either, that will have to be next on my list. :) So happy you stopped by! Glad you enjoyed the photos, take care. Yay let’s hope for snow, for the both of us! That’s great that you’ve got a Paris trip coming so soon. I hope you have a great time!